St. Giles' church has an idyllic setting on the west side of the village. The entrance gate is approached via a short stretch of unmade lane from the junction of Hallaton Road and Blaston Hill. Parking around the church is limited. The plain wooden pews allow seating for about 60 people. An electronic organ is positioned at the rear of the nave. The single bell hangs above the west wall, see photos. The church has no hazardous steps and the main door is wide enough for a wheelchair. There are wall mounted electric radiant heaters. Mains water is connected to a hand basin in the vestry; there is no toilet. Regular services are held approximately every fourth Sunday. See the Blaston Services page. Please contact the Rector in the first instance if you are considering a special service in Blaston church. For other matters please contact the churchwardens. 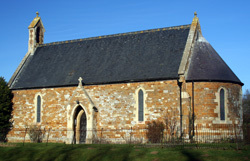 More information regarding this lovely church is provided on the History page. To the east and north of the tarmac entrance path is a burial ground managed by Harborough District Council. To the south of the church, the land is privately owned, for family burial purposes. 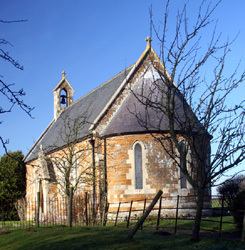 In Blaston there was also another chapelry, but of Hallaton, known as St Michael’s. This was rebuilt in 1868. It fell into disuse and became redundant. It is now a peaceful ruin, occasionally used by St Giles for summertime outdoor services.